The Questors Theatre's site combines a Victorian lodge frontage with extensive purpose-built theatre facilities extending behind. The original Lodge has been remodelled inside to contain our Grapevine Bar and a meeting room on the ground floor, and a rehearsal room on the first floor. The east wing of the site contains a Studio performance space and a rehearsal room. More recent redevelopment has seen the addition of the Theatre Office and also men's and women's toilet suites. Extending back from the Lodge are the large glass windows of the Upper Foyer which serves the Playhouse. This important milestone in the development British theatre architecture was opened in 1964 by HM Queen Elizabeth the Queen Mother (and has since been twice visited in a private capacity by her grandson HRH Prince Charles the Prince of Wales). Behind the Playhouse are dressing rooms, and an extensive suite of wardrobe facilities over two floors. At the very back of the site is a large scenic workshop - again purpose-built. Recent redevelopment projects have seen improved access including a lift to the first floor; a third rehearsal room at first-floor level off the Upper Foyer; and redecoration and refurbishment of all public foyer areas. 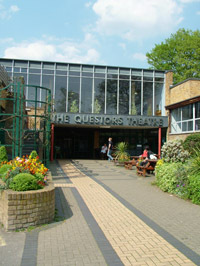 The Questors Theatre is the largest independent community theatre in Europe, with facilities of the highest professional standards, which are widely used by a large number of theatre, TV, film and other companies and individuals for rehearsals, auditions, conferences, training, and of course performance. We are conveniently located in Ealing, just four minutes' walk from Ealing Film Studios, ten minutes from the nearest BR and tube service at Ealing Broadway, and around half an hour's drive or tube journey from Heathrow airport. We have our own private car park with around 20 bays immediately in front of the Lodge, and these spaces usually have good availability for hirers and visitors during the day.